Featuring on this weeks ‪#‎ThrowbackThrusday‬ is My Skylar by Penelope Ward. This was one of those books I thought I needed a therapy to get over it! This was most ANGST and POWERFUL LOVE STORY I have read in a long time, making my heart cry in that process. 'Loving someone too much causes insufferable pain’ should have been the tag line for this book that’s how it was for Mitch and Skylar-Best friends, confidant, strong lovers, centre of their universe and mostly soulmates but they still saw their relationship falling apart. It’s mostly because of the blurb I read this ASAP. There is no need for spoiler’s the blurb says it all! So I jumped in to find out what “How did he lose her FOREVER” ??? Mitch met Skylar when he was staying with his grandmother during a summer when they were 11 and 10. They bonded over the common grounds that both their parents are separated. Since then they became each other’s rock. They reunite after five years and now their relationship is stronger than ever, with growing feeling for each other they never cross the friend zone with the fear of repeating their parent’s mistake and losing their friendship until their first KISS. Their love was indestructible, the kind which makes your heart fill with warmth, hope and desire. “How do you know there's a god?”. 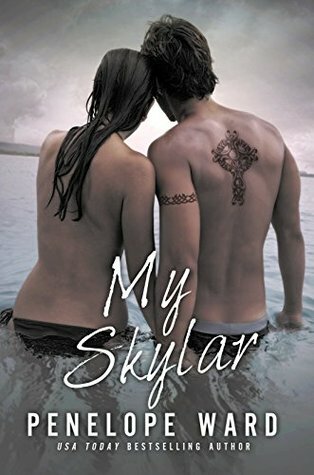 Mitch and Skylar are the characters you immediately fall in love, it goes without saying that I was totally engrossed with their story and connected with them right from the beginning. They made me smile, laugh, pray and hope they have a happily ever after because this whole book screams that they are meant to be together. That’s when my BLOOD STARTED BOILING. I was so frustrated with her and her decisions, how can she decide for both them? Didn't she know their love is stronger that can withstand any obstacle and Mitch will never stop loving her. Now this is just the BEGINNING of the HEARTHACHE’S to come!! If I thought their separation caused me unbearable pain the bomb that was dropped on me was the FINAL NAIL IN THE COFFIN!! The reason I gave 4 and not 5 stars is the second half of the book. Where I connected with the story in first half, the second half felt rushed. It takes place in present day when Skylar moves to town with her fiance and Mitch sees her after five years. He knows he is the reason for her leaving town and cause for her despair but he never stopped loving her and apparently so does Skylar. Mitch vowed to make her his to love her more than he hurt her and to finally have his world back. I found this part loud and overemphasized! She says Kevin (her fiance) saved her from misery, protected and supported her, then why was he presented in a way you feel she's trapped in his world that he makes her unhappy just to prove a point that she is not over Mitch? It was rather injustice to Kevin’s character whom she calls her safe haven. But I love this book so very much, I think I need a therapy to get over it! This is one of the POWERFUL LOVE STORY I have read. 'Loving someone too much causes insufferable pain’ should have been the tag line of this book that’s how it was for Mitch and Skylar-Best friends, confidant, strong lovers, centre of their universe and mostly soulmates but they still saw their relationship falling apart. Ohk! I should stop talking now before I suffer another heartache.